Over the last decade, the side effects of the rabies vaccine for cats have stirred up quite a bit of controversy. Although the percentage of cats that experience the more severe side effects of this vaccine do not represent the majority, these adverse events are particularly alarming to pet owners who were not properly informed regarding the vaccine's consequences. A vaccine stimulates the immune system and directs the body's attention away from what may be more pressing matters at the time of inoculation. This immune confusion can result in many symptoms. However, there are certain chemicals added to preserve vaccines, and it is impossible to tell ahead of time whether or not a cat may react to such chemicals. Also, sometimes vaccines are faulty or have expired, or they may possess a number of issues. Such factors can produce a negative response as well. The number one most controversial side effect of the rabies vaccine is similar to that of the feline leukemia vaccine. Both vaccines have been known to cause a type of cancer called sarcoma. Sarcomas are tumors that can grow to be very large in size. In the case of vaccinated animals, they often form close to the injection site, although this is not a hard and fast rule. Invasive surgery is frequently needed to remove these sarcomas, if they can be removed at all. This sarcoma issue has caused veterinarians to rethink the frequency of vaccinations for certain types of animals, and even the necessity in specific cases. Should You Vaccinate Your Cat Against Rabies? Regardless of the vaccine's side effects, the rabies virus is no small matter. Rabies is highly contagious and typically lethal. It affects all sorts of animals from cats to dogs, coyotes, squirrels, and even humans. It is transmitted through mucus and saliva and is a threat to many wildlife creatures and outdoor pets. This is why, for so many years, the vaccine was considered a mandatory inoculation for domestic pets in some municipalities. Since the virus is easily spread and it's symptoms are quite hideous during its last stages, prevention by vaccination was thought to be essential. Rabies is also considered a public health threat. Pet owners with outdoor animals are strongly advised to vaccinate, but unvaccinated pets are either put down immediately after infection or are quarantined for several months after possible exposure if the owner refuses to have the cat euthanized. Still, this quarantine process will often cost pet owners significantly. In some states, the fine for an unvaccinated animal that contracts rabies is also no small matter, not to mention the lawsuits that may arise from this situation. 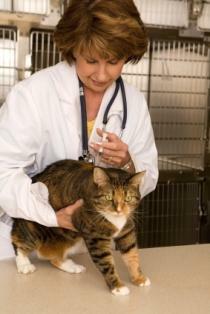 Recently, veterinarians have altered their policy regarding the vaccination of indoor animals. It is no longer considered mandatory across the board to have strictly indoor cats vaccinated if they have no exposure to the illness. This is because the side effects of certain vaccines pose a high enough risk that to vaccinate unnecessarily may likely cause damage to the animal. Since outdoor animals are at a high risk for a number of communicable and often fatal illnesses including rabies, vaccinations should be considered a necessity rather than an option. However, an even better response to the vaccine side effect issue is to keep your pet safely indoors. Outdoor pets should be vaccinated for rabies annually or as recommended by a veterinarian, but an indoor animal does not require such frequent immunization.